When Christmas rolls around, it can be oh-so-tempting to make our homes look like every Christmas movie ever. Luckily, there’s a way to do that without busting the budget – especially with these cheap Christmas decoration ideas! Which is great news, as while decorations certainly look pretty, the damage to your wallet is a bit less beautiful. So if there’s any way you can save money – especially on things like decorations that are packed up in a box for most of the year – then this is definitely something to consider doing. When you see people starting to sell real, live Christmas trees on street corners, you can’t help but get a jolt of excitement. It means Christmas is really, truly coming! But wait a few weeks and reality hits when you start to see people dumping their Christmas trees after the holidays. What a waste. The trees piling up on the side of the road in early January are easily worth hundreds of thousands of dollars – just being tossed outside into the cold, wet winter. So why not take a look at some of the absolutely beautiful artificial Christmas trees as a great alternative to buying a real one each year. They come in an almost unlimited range of sizes, meaning they can be perfect for a smaller apartment or a larger house. And while some of the bigger ones can get above the $100 mark, the mid-sized ones at around $40 (or less!) are just as good. Better yet, they last (practically) forever! The one my family owns has lasted 20 years and you can’t see any difference from year-to-year. Also, not only does an artificial tree work out as being significantly cheaper over time, but they are far cleaner (no dropped pine needles!) and much better for the environment. I can also confirm that Santa is still happy to leave presents under an artificial tree! After all, your house will look so much better, won’t it? And it’s fine that the sparklier option is also double the price, right? I’m sorry to break it to you, but no one will notice that you’ve splurged on the expensive one. And before you know it, you’ve blown your budget on some glittery balls that you use once a year. For example: this packet of 24 red Christmas ball ornaments costs $21.99. Yet this packet of 24 red Christmas ball ornaments costs $5.99. What on Earth justifies this $16 difference? Yes, there is a slight difference in their patterns, but who will remember that when they’re simply a bunch of red balls on your (artificial!) Christmas tree? So I have no hesitation in recommending that you should buy the cheapest Christmas decorations available. Amazon has a great range, of course. But don’t forget to check out what’s on offer at super cheap places like Dollar Tree! For example, take a look at their hundreds of Christmas decorations here – all for $1 each. You could easily decorate your entire home for less than the cost of one expensive decoration in other stores. And we all love being festive AND frugal! While staring in horror at the price of Christmas balls in that last section, I was also recommended to purchase a Santa toilet seat cover. Now, that is undeniably hilarious. But that is also $17 that will sit in my bathroom for a couple of weeks, get packed into a box and be either forgotten or brought out in a cloud of dusty regrets next year. So here’s a tip that can be applied to your finances all year: just because something exists doesn’t mean that it has to be bought. Christmas decorations are expensive and take up space when it’s not December. Some well-placed tinsel is more than sufficient and takes up next to no space in your “random crap” cupboard throughout the other eleven months. Similarly, while you should focus on saving money on your Christmas dinner, the table itself doesn’t need reindeer candles or cutlery covered in stars. Some artfully tossed tinsel on the table alongside normal candles and your usual cutlery set will ensure that your meal looks beautiful, classic and sufficiently festive. There’s a reason this post isn’t full of DIY ideas. Mainly because there are already one million absolutely stunning creations all over Pinterest for DIY Christmas decorations. And some of them are amazingly simple! A few popsicle sticks, some glue, and a dash of silver spray paint – and suddenly you have beautiful snowflakes ready to be mounted on your wall! That said, while that can be cheap to do, it also takes time – which many of us don’t have around this time of year. So for those of us who may lack the time or the patience or the creativity streak (hands up if you’re guilty of all three! ), here are some of the simplest options I found for decorating cheaply. And as a bonus, while these may be super cheap Christmas decoration ideas, they absolutely don’t look like it. In fact, their simplicity is what brings out their elegance, meaning your home will look like a Christmas dream – while letting you stick to your Christmas budget! Buy one pack of silver Christmas balls and one pack of gold Christmas balls. Then simply fill them with a random assortment of each colour. You can also add some pine cones if you have them near where you live. These make a great table centrepiece or can be placed on a mantle to add some Christmas spirit to a room! Buy a set of mini-Christmas lights. Keep one vase spare from the previous option. Fill the vase with the lights and switch on for a beautiful effect. Buy a silver marker that writes on and is able to be wiped off glass and mirrored surfaces. Proceed to draw snowflakes on all of your windows, write Christmas messages on all of your mirrors (you could even change it up each night in the countdown to Christmas Day) and just go generally festively crazy. Wrap it around anything you can find. This person wrapped it around a pillow for an amazingly effective look. 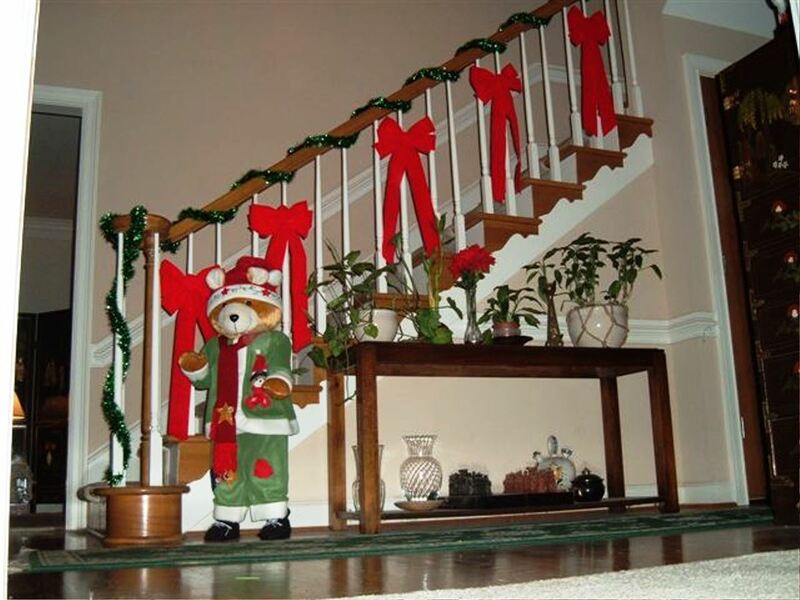 You can tie large bows along any staircases you have and let the ends hang down (your cat would love this option). You could even simply tie bows and attach them to doors instead of wreaths. 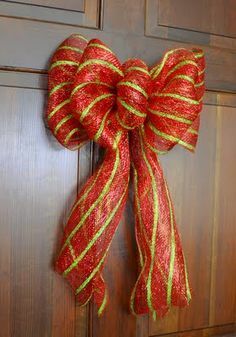 Ribbon is also great for tying around chairs for a Christmas dinner with bows hanging off the back! Buy several rolls of Christmas gift wrap (you’ll need several rolls as you want a few different patterns). Find any books that you won’t need over the coming weeks and wrap them in alternating wrapping paper patterns. Stack the wrapped books artfully around your house. Consider recruiting any leftover Christmas balls and/or ribbon to increase the festive factor. And voila! Your home is ready for Santa to make his grand entrance – without busting your budget! I’d love to hear your ideas for Christmas decorations that take the least amount of money (and time!) possible. Let us know in the comments below! If you liked finding out about 4 Super Simple and Cheap Christmas Decoration Ideas, why not share it with your audience?